Living Space: 18000 sq. ft. The main building is 6000 sq. ft. with 25 ft. ceilings and houses the kitchen, indoor dining and living rooms. A large cane thatched covered terrace adjoins this building and offers open air dining and living rooms. While two large dining areas provide formal seating for 16. A two-story building contains five bedrooms and bathrooms, all with ocean views. Each floor has a wide covered terrace which opens up to individual bedrooms; the two levels of terraces are conneced through an external staircase. A separate building houses the master bedroom and baths which is adjoined through a walled garden to two additional bedrooms and bath. Another building contains a large family / entertainment room with full bath and stairs leading to a second floor sleeping loft with queen size bed. The final building houses ground floor carport, laundry, sotrage and utility rooms with a full apartment located on the second floor. All eight bedrooms and the sleeping loft have air conditioning and open to private terraces with ocean views. Seven bedrooms and the loft have queen size beds while the master bedroom has a king size bed, as well as a jacuzzi bathtub. All rooms have tile floors, ceiling fans and high ceilings. Five bedrooms have 15 ft. ceilings while the three bedrooms on the 1st floor of the bedroom building have 10 ft. ceilings. The can covered ceilings of the main building soar to 25ft., providing excellent airflow and insulation from the tropical sun. The large – 1500 sq. 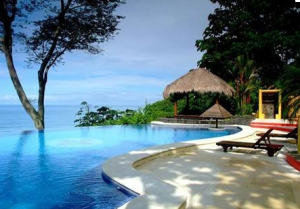 ft. – infinity swimming pool appears perched on top of the Pacific Ocean. With ocean views south to the Osa Peninsula and with toucans and parrots flying overhead, you know very quickly that you are in another world.